Cheerleading has a rich history in the United States. Many cheerleaders begin the activity in elementary school and can continue to participate through middle school, high school and university. 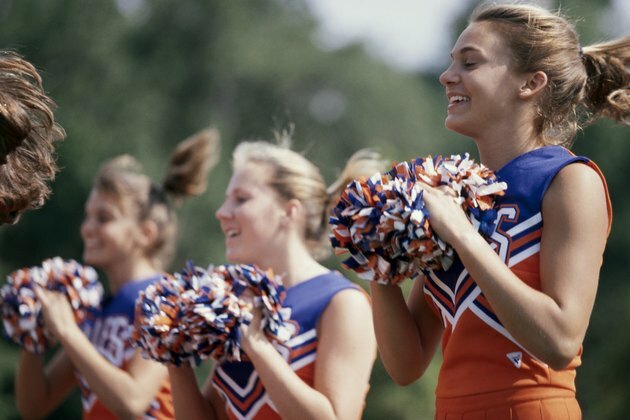 Even professional sports teams have cheerleaders, so those who love to cheer can continue the sport into adulthood. According to the book "The Complete Guide to Cheerleading," organized cheering started at Princeton University in 1884, when the crowd created a cheer to inspire its team. In 1898, Tom Peebles became the first cheerleader when he led the crowd at the University of Minnesota. Later that year, a group of six men at the University of Minnesota continued the trend and expanded cheerleading. In 1923, cheerleading expanded to include women. Cheerleading has grown considerably since its origins -- most college football and basketball teams now have their own squads. In addition, every team in the NFL has a cheerleading squad, as well as the majority of NBA teams. In 2003, the Florida Marlins became the first MLB team to introduce a cheerleading squad, which other teams have since duplicated. According to the book "Cheerleading and the Law: Risk Management Strategies," with all of the high flying involved in cheerleading, injuries can happen. From 1982 to 2006, 45 major injuries occurred during high school cheerleading events, with two of those injuries leading to deaths. Of the 45 injuries, 14 of them led to permanent disabilities, including paralysis. During the same years, one female college student died after a cheerleading stunt, while an additional five ended up with a disability and 11 suffered serious injuries. Males accounted for two injuries resulting in disability and two other serious injuries during that time frame. To help maintain safety in the sport, the American Association of Cheerleading Coaches and Administrators has implemented some rules that members must follow. During a practice, teams must have a coach present and receive all of the proper training before attempting a maneuver. During a forward roll, the top person must begin in a non-inverted position and maintain hand-to-hand contact with two bases throughout. These moves must also include a spotter who can protect the top person's head and neck in case of a fall. During partner stunts, bases who support another cheerleader cannot hold props. For elementary, middle school and junior high cheerleaders, additional sanctions against tosses and the number of twists in a dismount exist. Approximately How Long Is a Softball Game? What Tumbling Skills Do You Need for Cheerleading? What Are the Most Popular Youth Sports?